David Dickey, the founder and head trainer of Doggie Boot Camp, has more than 30 years of experience working with dogs. In addition to his own training approach, David has learned from other great trainers and behaviorists around the country. Below are his observations that he brings into his practice of dog training and behavior modification. What makes a dog trainer great? Great trainers do not pretend they know everything. Their experience gives them a behavior pattern recognition that allows them to pick the right approach for the dog they are training. A skilled dog trainer knows that there is no substitute to patience and kindness. If it takes an extra day of training because the trainer’s approach is too soft, that is far superior to pushing the dog beyond its comfort level, which can jeopardize your relationship with your dog. Great trainers practice a “trust first, train next” approach. Once you establish trust with a dog, you are able to shape its behavior into whatever you’re trying to teach or modify. Lastly, great trainers enjoy what they do, are passionate about achieving results and are able to effectively communicate to the owner how to duplicate the same results. Dog training takes patience, time and consistency. Says David, “The cross-pollinating of many methods with the methods of several great trainers, including dolphin and other mammal trainers, has taught me so much these past 30 years and allowed me to better understand what works and what doesn’t.” Simply put, there are no short cuts worth taking. Positive training has the greatest predictable long-term effects and is best for the human/animal bond. Dog psychology is not all that different from child psychology. Dogs, like children, have different personalities, and parents with multiple children understand that what might motivate one child may not work with another. So just as you would modify your approach with how you influence and help shape a child’s behavior, the same is done with dogs. We take into account that some dogs are naturally more confident than others and have different experiences as they grow. This is why taking a more patient, soft and flexible approach works well at first. Then as you build a relationship with the dog, you can learn how to properly motivate the dog to achieve the result the owner is looking for. 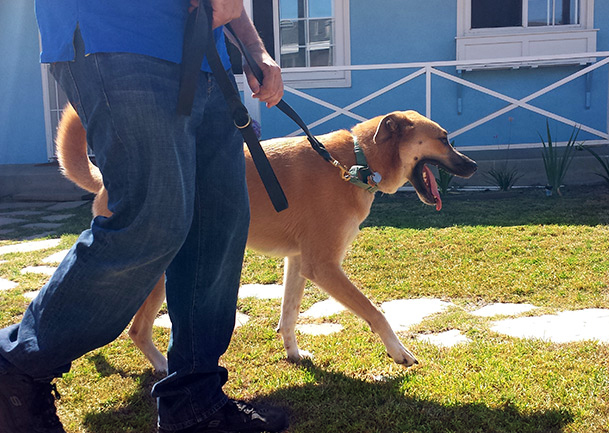 Basic obedience is “sit,” “stay,” “down,” “come,” “heel” and walking well on a leash. 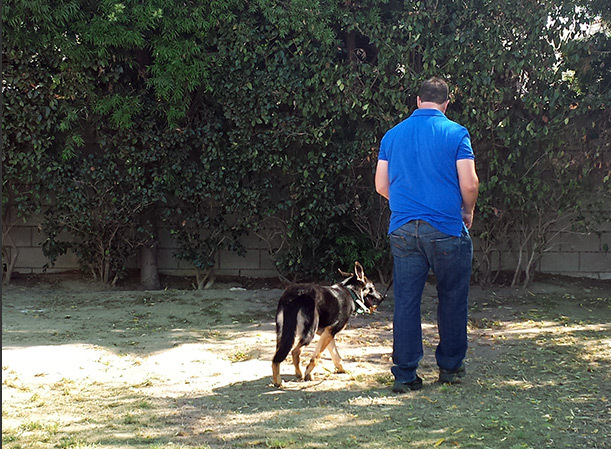 The first training sessions are off-leash in a safe, enclosed environment. No words are used—only hand signals and body language. Once we get the results we are looking for, we reinforce it with whatever method we’re using (treat, praise, clicker etc.). Once the behavior is on cue and predictable, we then put the label on the behavior. As an example, “sit” is not said 52 times before the first sit. “Sit” is said only once the dog predictably performs the behavior on cue. Once the dog understands the word that is paired up with the behavior, we can eliminate the body language and hand command and we are just left with the word. Body language, hand commands and words are all important. Words are the hardest for the dog to understand and adding inflections, especially if frustrated, can be problematic. So by subtracting them out at the beginning of the training process and adding them in later, it actually dramatically improves the training process. All behavior modification must have a basis of basic obedience. The dog needs to trust the trainer and understand that if it performs a positive behavior or omits a negative behavior it gets something. Once the basics are properly rooted, it is far easier to modify a more complex behavior because you have taken the time to develop a proper relationship with the dog and understand how it learns best.